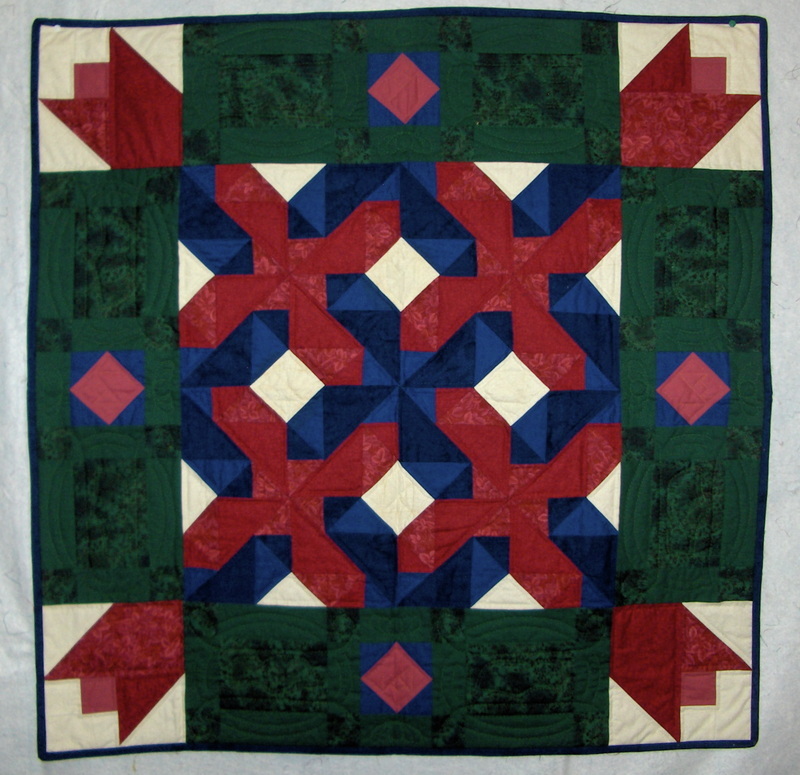 Check out some photos of past mystery quilts. This is a vital part of our quilt guild. This was our inaugural mystery quilt event. Members were given fabric purchase information at the first meeting and then information for each block at succeeding meetings. Can you hear the noise? 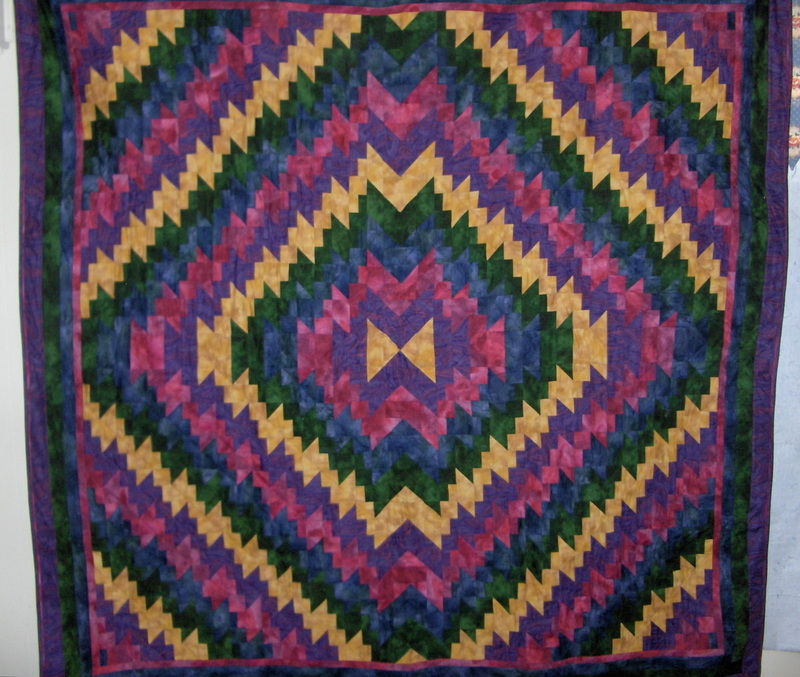 This pattern reminded some members of an "Around the World" quilt but with an exciting "sound" element. This mystery quilt is just what it is titled "Row-by-Row". All the members knew was they were going to be given the directions for one row each month. The quilters had such fun seeing what was coming next. There was a lot of "fussy cutting" going on to fill the cars and busses, windows and other areas around the quilt. When all were placed side by side, they created a very colorful town. This mystery quilt was a great adventure. 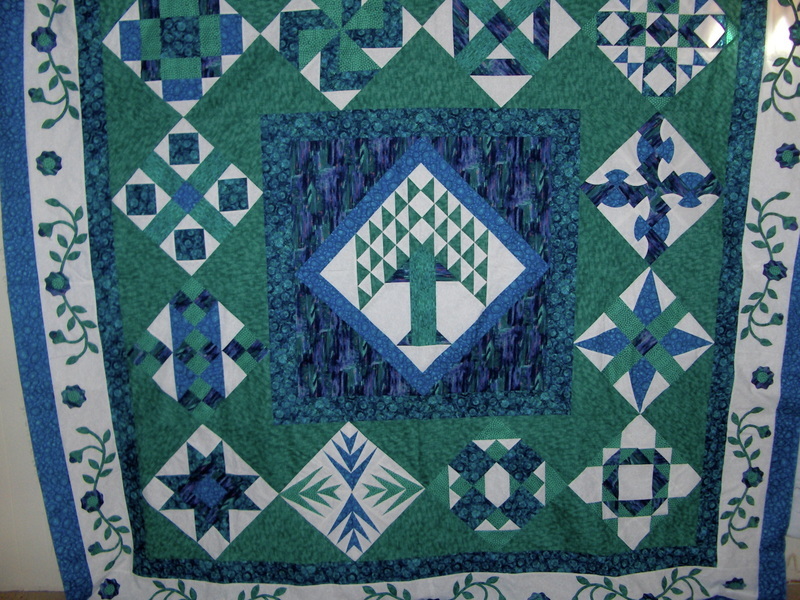 This quilt has three different blocks. We made eight identical blocks each month for three months. We were then instructed to go home and arrange them in an arrangement that we liked. A digital camera helped the editor see the variations that could be made and to, more easily, select the final composition. 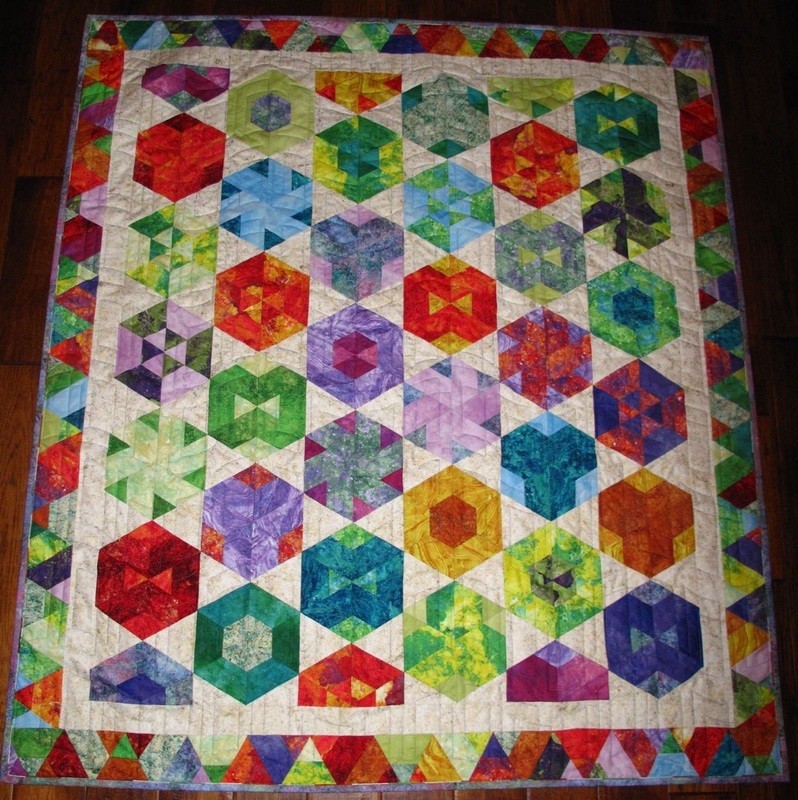 It was hard to decide because each time you moved the blocks you had a very differently designed quilt piece. 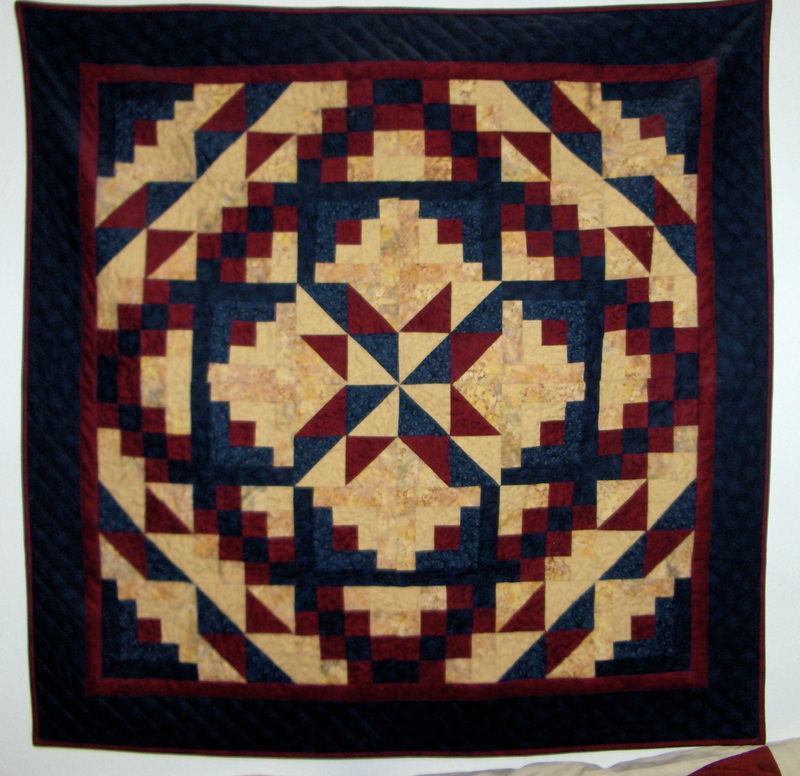 With the variety of fabric and the different arrangements, it was hard to believe the same pattern was used by all the quilters. This quilt was a beautiful patriotic quilt. 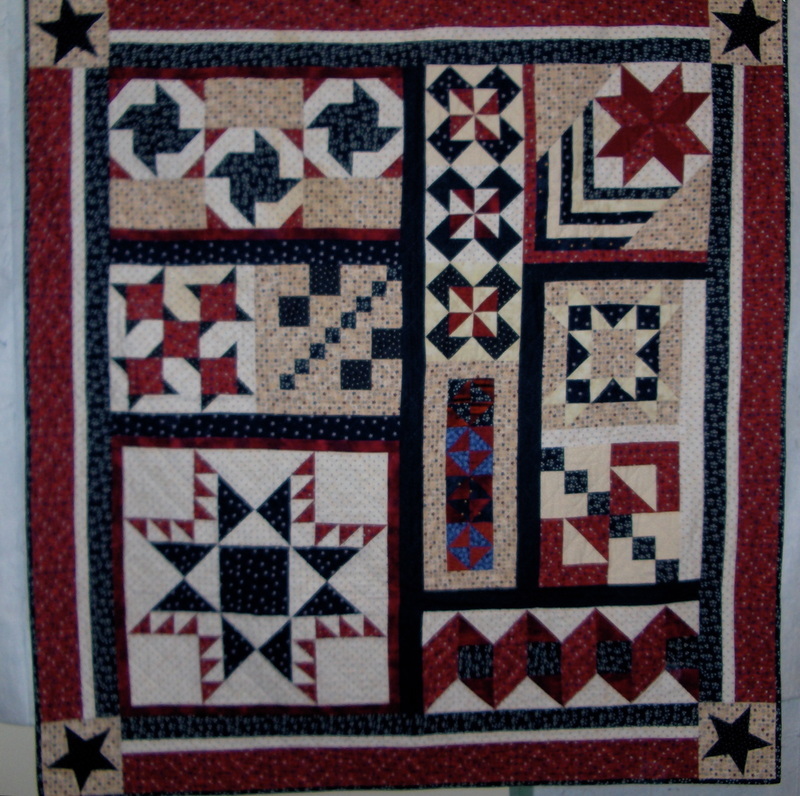 Every quilter chose to make a patriotic statement with their quilts. 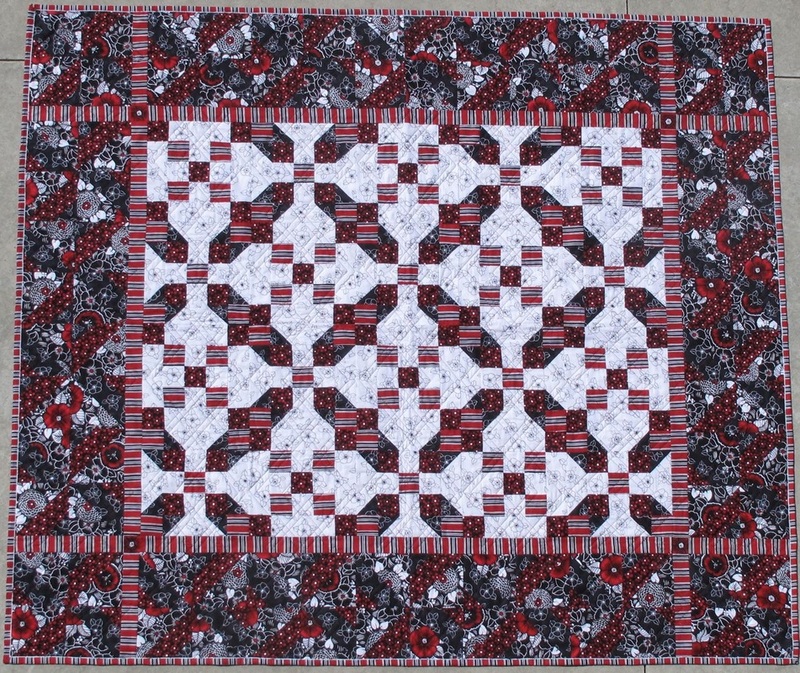 One of the biggest challenges with this quilt was the fact that all of the blocks were different sizes. To have them fit together correctly was like putting together a puzzle. It was a grand project, one that all were proud of. This quilt project was a true mystery quilt. Fabric requirements were given at the first session. The next session, quilters were given directions about how to cut all of the pieces. The pieces were stored in zip lock plastic bags and labeled as clues. Each month a different clue was revealed, either a block or the next border. In the end, the mystery was solved and all who participated had a wonderful lap quilt to enjoy. 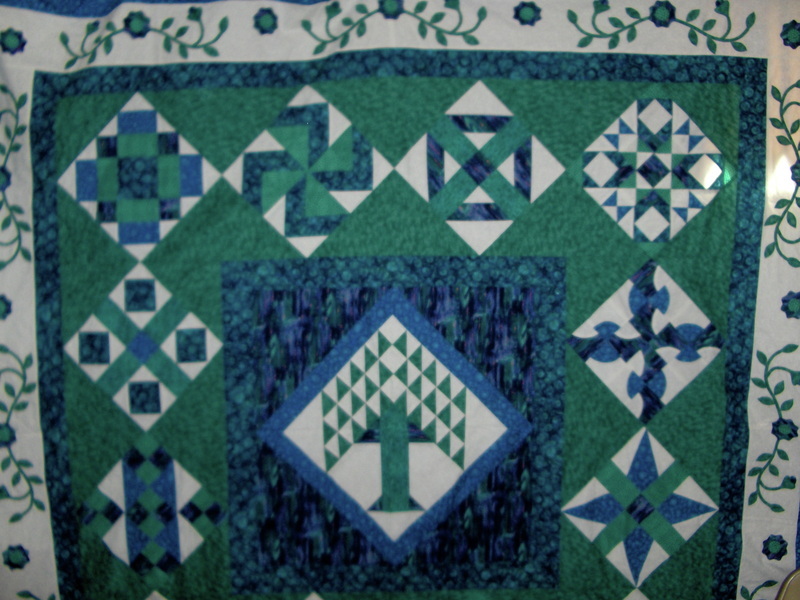 This mystery quilt is a Biblical quilt. Each block is based on a Bible story or verse. The center block is the tree of life. The hand-appliqued border is the Rose of Sharon. Can you guess the Bible connections for each block? The names of the blocks will appear here soon. This block took over a year to complete but everyone felt it was worth it. 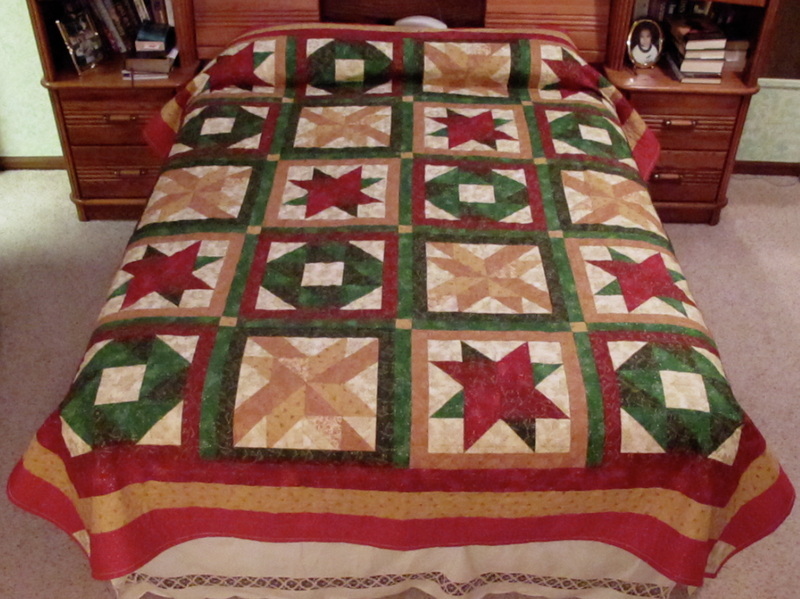 Because the quilt is so large, it needed two photos to do it justice. This is another version of the Road to Jericho without the center block or appliqued border. This mystery was a simple, short, three-block design mystery quilt. Some members made table runners, some wall hangings and one even got ambitious and made a queen-sized quilt, pictured here. It has 12 different star blocks set on point with the set in squares forming an 8-pointed star. 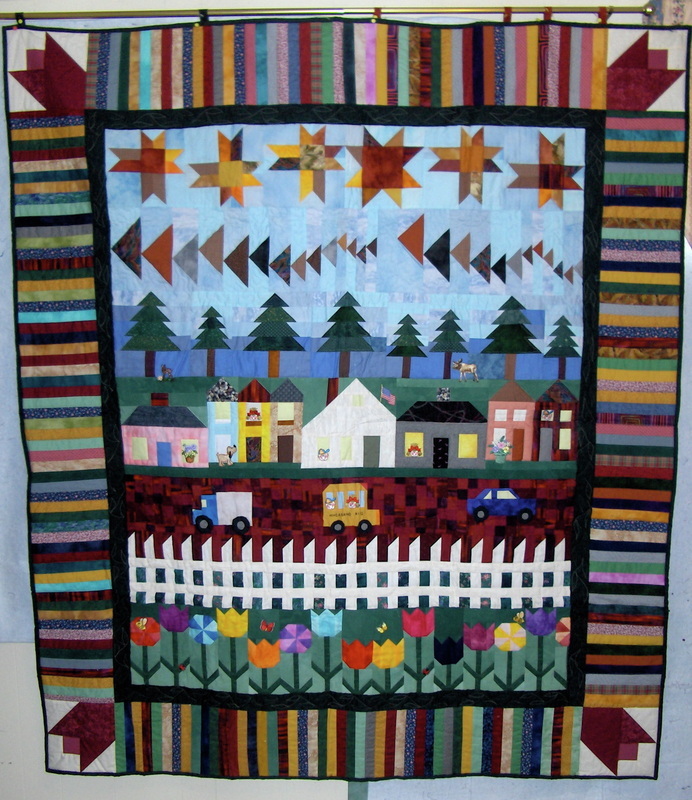 The quilt features a braided border to frame the stars. The directions for the quilt were given each month, beginning with creating stratas (strips) for quilting. The construction directions came in three parts - top, bottom and middle. Check other pages for photos of different members projects. This quilt had many possibilities as it was constructed. There were six different hexagon patterns that could be mixed and matched as desired. This quilt has all of the hexagon patterns, arranged randomly. Others made a single style of hexagon to put in their quilt. 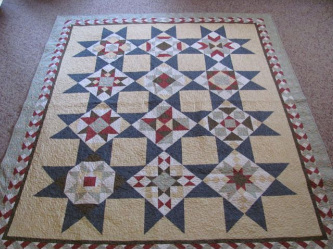 This quilt, after the blocks were assembled, could be arranged in different ways. 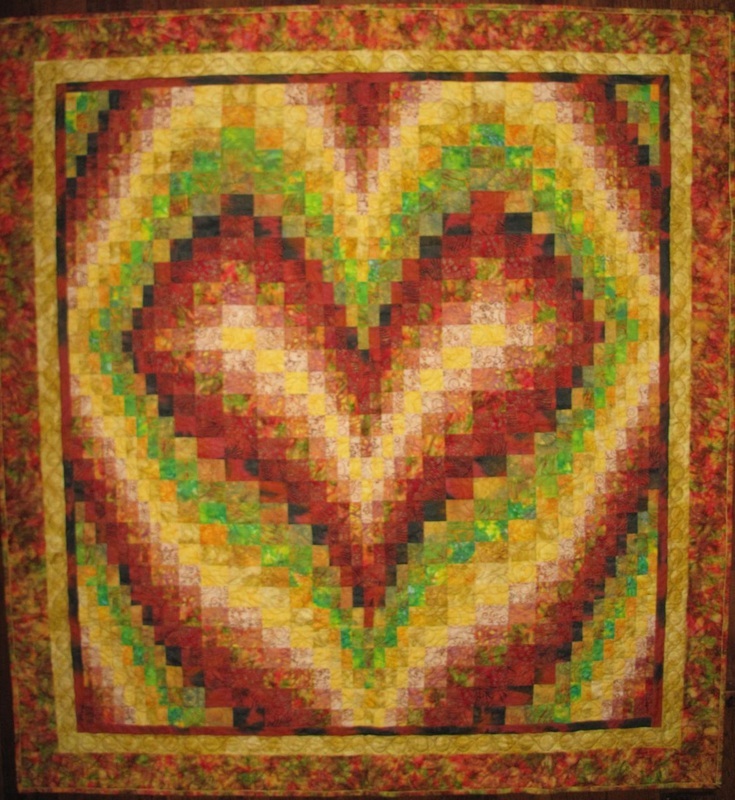 The stripes added a different dimension to the quilt. 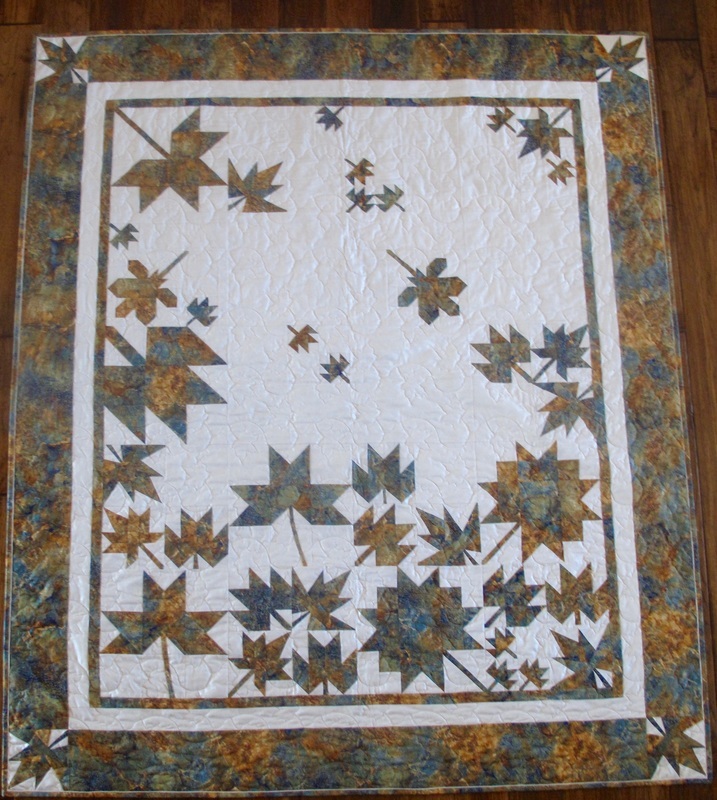 This quilt was created to celebrate the 30th anniversary of the Quilted Leaf Quilt Guild. The quilts will be on display in December 2016 at the Meadowlark Art Gallery in Grant. 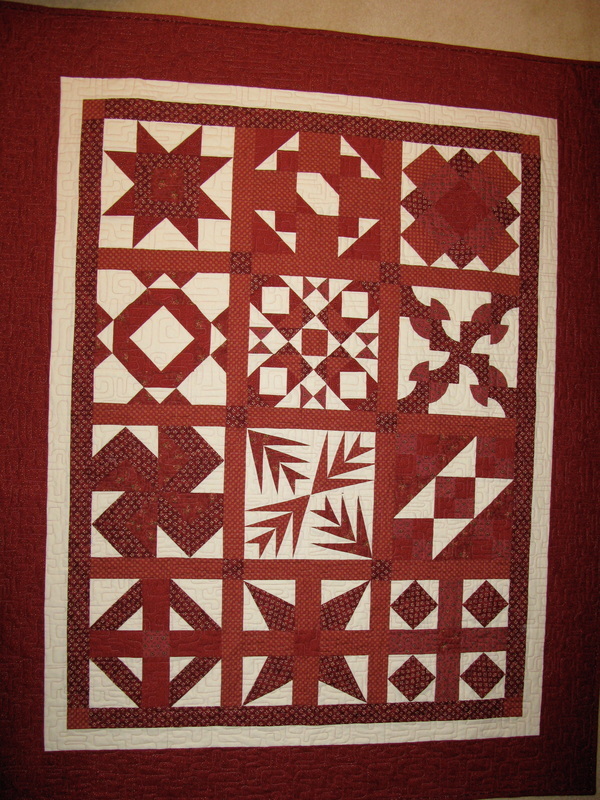 This quilt pattern was designed by Nebraska quilt designer, Scott Flanagan. It was featured in the Quiltmaker magazine May/June 2015 issue. 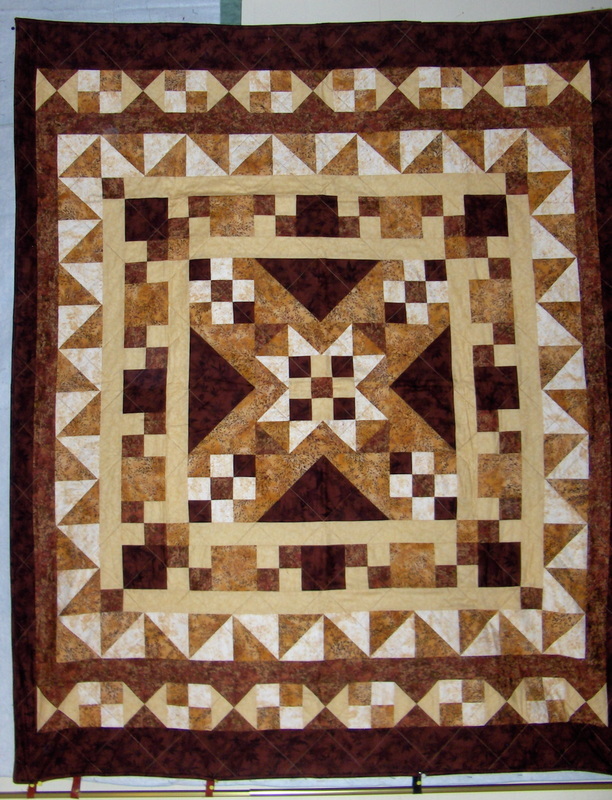 The border used in this quilt is really quite easy to make. Following the directions you are able to create accurate corners.